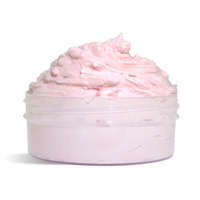 Add a soft blush to your skin with this light-pink blushing body butter. It's made with cranberry butter and safflower oil, and scented with the aromas of vanilla, French pear, and cashmere musk. Package in clear eight-ounce jars with white tops, which complement the pink sparkling color of the body butter. You Save $5.90 by purchasing this kit rather than buying the items separately. COMMENTS: I loved this kit! It Had everything I needed to make the perfect amount of product to start with! I did swith the fragrance because I personally could not smell the cashmere scent that much. The color is perfect and just what I wanted! I wI'll definitely be keeping this around for a while! I have been using it myself DAILY! COMMENTS: Very thick rich and creamy! Excellent for those with dry skin. Don't recommend for use on oily skin. The scent is absolutely lovely. It felt like Victoria Secret in my kitchen. In Miami we wear sandals a lot. Our skin and feet are baby soft. Big Thumbs Up! • I loved it. Wouldn't Change it. COMMENTS: Love this. I can't make enough of this body butter. My customers love it and buy me out as fast as I make it. I love the scent but going to change it up the next time and use a cranberry scent instead. COMMENTS: I did not care for this product it feels sticky and greasy. 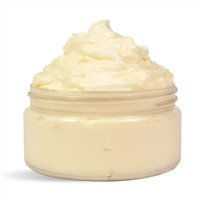 WSP Response: Most body butters do have a greasy feel as they are intended to super-moisturize the skin. If you are looking for a dryer body butter we suggest adding Crafter's Choice Slick Fix. "Cranberry Butter - My new BFF"
COMMENTS: I recently tried the Blushing Body Butter Kit with cranberry butter and have been very pleased with the results. I'm a fan of cranberry butter - it's done wonders for my chronically dry elbows!! COMMENTS: I ordered this kit so that I could get my foot in the door of making my own products down the road. I absolutely love this kit. Instructions were clear and easy to understand. The fragrance was AMA-ZING! Smells delectable. The only problem is that when I made the first part of the batch, I filled all 3 jars, each with 6.5 oz of product. Which means when I get around to making the other half, I'll more than likely be 1 jar short but otherwise I highly recommend this kit for beginners or for someone wanting to add to their line!!! "The recommended selling price is $17.95 and the kit makes 5 jars, yielding $89.75. The kit costs $87.95, so there would be a total profit of $1.30 on these 5 jars if you discount your labor and the cost of labeling. Are the prices quoted correctly for this item?" Staff Answer There may have been price increases on some of the ingredients which were not reflected in the Sug. Retail Price. We have updated this to $24.95 per jar, which would give you a profit of $36.80. You can also try a higher price if you feel people will pay this. You also have a few ingredients left over which can be used for future recipes. "How many total ounces does the kit make (I am confused where the directions say to repeat, do does it make it make 5- 8oz jars total or 10-8oz jars total?)" Staff Answer This recipe makes 5 jars containing 8 oz. each. We have updated the instructions to make them easier to follow. 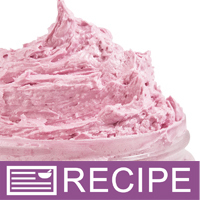 "Can I substitute the cranberry butter for mango butter in this recipe? Thank you. " I would recommend maybe substituting with shea butter as this cranberry butter is made with shea. Staff Answer Mango Butter is a similar consistency so it would be a suitable substitute, however, the finished product color may not be as pink.